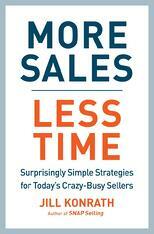 New Book: Want More Sales in Less Time? Is it really possible to meet your goals working fewer hours? Even if you feel like it's virtually impossible to get everything done—despite working round the clock? The answer is YES. It's time to kiss crazy busy good-bye! How do you sell to crazy-busy buyers? That was the topic of my second book, SNAP Selling. I spent a full year researching how “overwhelm” impacts our prospect’s decision process and what we, as sellers can do about it. SNAP Selling has really helped me win more deals with those crazy-busy buyers. But I’m crazy-busy too. What do you have for me? I didn't have a good answer. Truth be told, I was feeling overwhelmed too, like I was always behind. Despite working longer hours, I just couldn’t keep up. It was impacting the quality of my thinking too. It was increasingly difficult to come up with creative strategies for challenging sales situations—something I’d always been good at. And the problem seemed to be getting worse. Much worse. Every seller I talked to felt the same way—too much to do, not enough time. Sales leaders were just as frazzled. Plus, they were under extreme pressure to improve revenue per rep. Finally …. I decided I was sick and tired of being crazy busy. My way of working wasn’t working anymore. With a vengeance, I threw myself into learning everything I could related to productivity. I studied the work of neuroscientists, psychologists, cognitive behavioral specialists, time management gurus and more. I was a normal human being—not a colossal productivity failure. We’re intrinsically wired to notice changes and be distracted. To work optimally, we have to view our day fundamentally differently. But knowing is just the start. I actually turned myself into a human guinea pig so that I could change how I work. That’s where I really ran into problems. We’re horrible creatures of habit; our brains actively resist doing things differently—even if it’s better for us. Overcoming that challenge was perhaps the most difficult. It took a while, but I finally reached the other side! Since the start of my personal productivity project, I’ve freed up 1-2 hours each day. I’m calmer, less stressed about my work. I’m thinking better, because I have the time and focus to do so. And I’m having fun again. That’s why I’m on a mission now to restore sanity to the world of selling. So we can achieve more. So we can tap into our best thinking. So we can become an invaluable resource to our customers. By doing less, a lot more thoughtfully. And that’s why I wrote More Sales, Less Time.